This regulation requires that tyres manufactured from 1st July 2012 for cars, light commercial vehicles and heavy trucks and placed on sale from 1st November 2012, carry a label showing the tyre’s wet grip, fuel efficiency and noise performance. The tyre labels are similar to the labelling already in use for household goods such as washing machines and dishwashers. 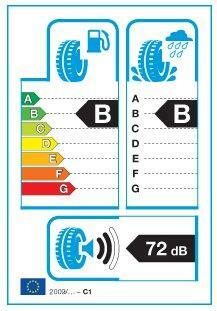 Each tyre will be given a performance rating from A-G excluding D to avoid an average performing tyre. Some tyres, such as retreaded tyres, off-road tyres and racing tyres, are excluded from tyre labelling requirements. However, higher adherence and lower rolling resistance are often contradictory objectives that have traditionally required a performance trade-off. Thanks to the new tyre labelling regulation, customers will be able to see and choose for themselves their preferred performances.